Meet my childhood nemesis. The hula hoop. I dreaded my interactions with the hoop, as I could NOT hula! I tried countless times, and failed. 😦 Oh, I could get it going around an arm or leg, but around my muscle-less middle, it was hopeless. The craze passed, eventually, and I heaved a sigh of relief. Like all things retro, the hoop is back. Yesterday in my Pilates class, Luna, our awesome beacon of light and inspiration to all feminine strength (she is amazing on the pole as well), spoke the dreaded words, “Everybody grab a hoop”. So I did. Feelings of inferiority that I thought had passed at 12 resurfaced, baring nasty thought of EPIC FAIL IN PUBLIC! But I did it! For the first time evah! I am a hula hooping goddess! Ok, so maybe not a goddess yet, but I was amazed!!! My childhood fail was washed away, and I emerged victorious over the hoop. 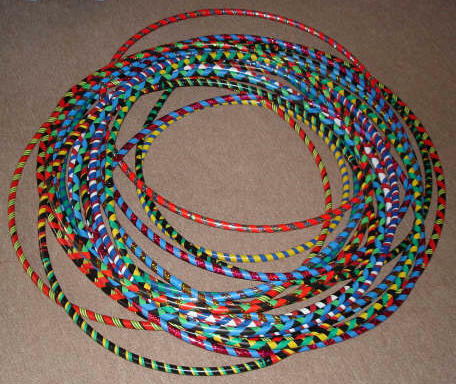 Man, we were so poor, we hula-hooped with a bike tire. A RUSTY ONE!! But we were good at it, and my sister could even do it from the neck. Ok…am now having this mental image of your sister with a rusty metal bike wheel swinging around her neck. Decapitation anyone??? HAHAHAHA!!! The spokes were gone, and it was smoothed out by the neighbor, so it was fine.